Panhellenic Council is UChicago’s largest women’s organization, and the umbrella organization for the four National Panhellenic Council affiliated sororities at UChicago. This letter serves as an update on what UChicago Panhellenic women have accomplished over the course of this year. We have strengthened our relationship with campus and broader Chicago communities and continue to provide an inclusive environment for our more than 550 members. We look forward to working with campus organizations to further that goal. As the school year draws to a close, The University of Chicago Panhellenic Council is writing to update you on what we have accomplished this year and what has been happening in our community. 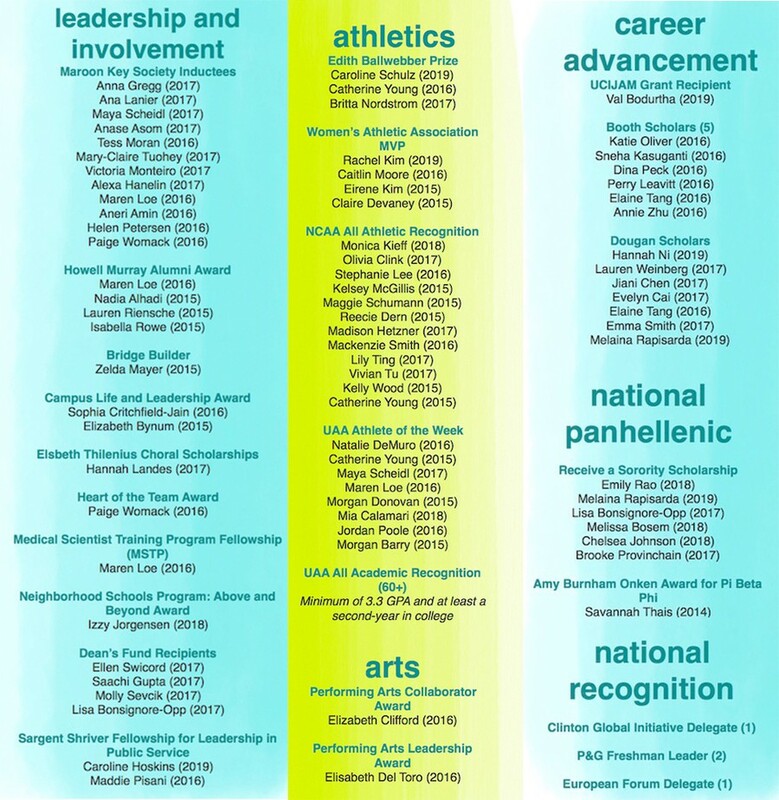 Sorority-affiliated women continue to thrive as leaders on our campus. This year, our women won numerous campus awards for their leadership, athletic performance, and outstanding scholarship. These include the Campus Life and Leadership Award, the Gertrude Dudley Medal, and the Howell Murray Alumni Award. Five Panhellenic sisters were inducted into the Maroon Key Society, eight are Student Marshals, and three were inducted into Phi Beta Kappa. 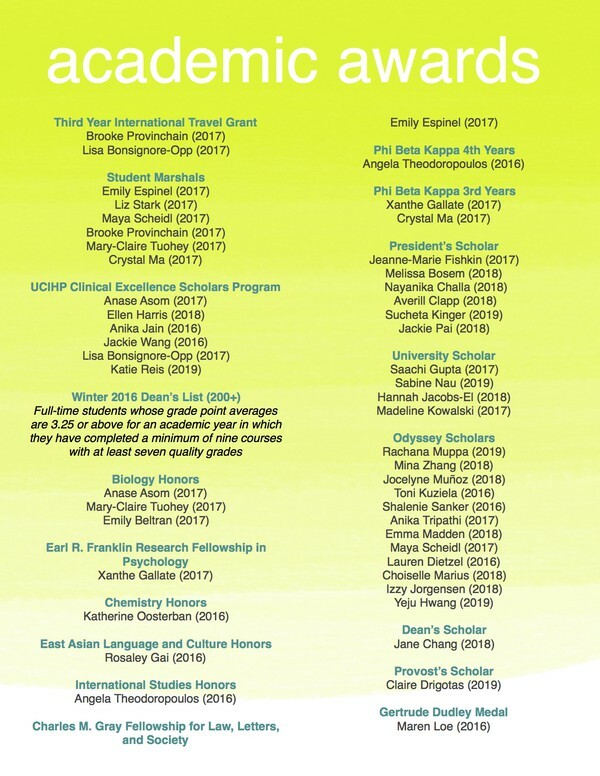 The College and Center for Leadership and Involvement does not recognize leadership in Greek organizations as a criterion for leadership awards. This year, Panhellenic has forged a stronger connection with the Multicultural Greek Council (MGC) organizations. MGC organizations participated in our Meet the Greeks barbecue in the fall during their Annual Step Show and in Greek Week programming this spring. MGC and Panhellenic leadership have come together to discuss some of the most difficult issues our campus is currently facing, with Panhellenic participating in MGC’s “Racism and Misogyny in Greek Organizations: a Discussion” event this winter. We hope to continue this spirit of cooperation to ensure that our communities remain welcoming places for all. Panhellenic has strengthened our relationship with the campus and broader Chicago communities. This year, our Greek Week kickoff event was attended by Greek and non-Greek students alike. Our Greek Week philanthropy day raised funds for a scholarship in the name of a recently deceased student. Many students also donated clothing to be brought to the Clara Women’s Shelter in Englewood. We plan to expand our focus on philanthropy in the coming school year, and are planning a beach cleanup event in the fall. 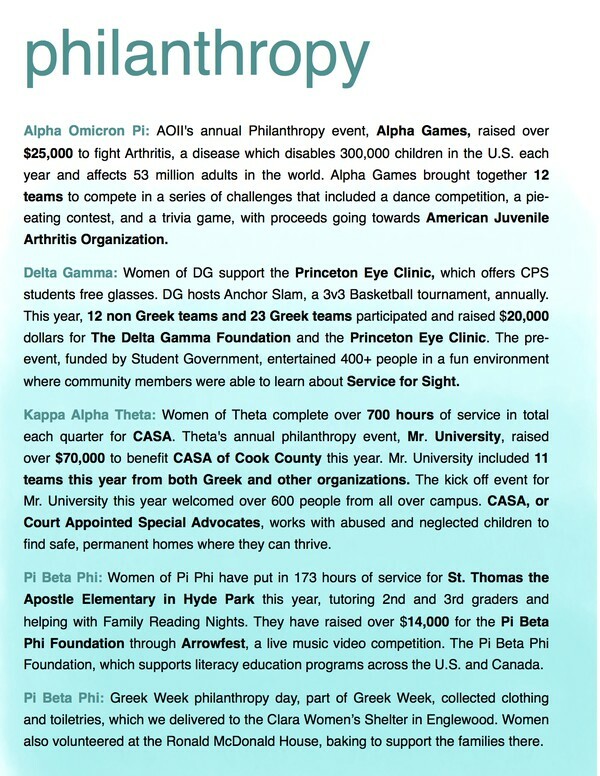 Our chapters’ philanthropy events raise large sums for charity and allow us to give back to the Chicago community. Expanding on our tradition of tabling at the RSO fair during prospective students’ visiting days, Panhellenic Council and the Office of Admissions partnered to host two “Going Greek Has Never Been So Sweet” events for prospective students to learn about sorority life and meet women in our organizations. We were also excited to be listed on the official schedule provided to prospective students. We are proud that our Panhellenic community has come together in response to new challenges we have faced this year. Though we feel our campus has a long way to go in reaching a satisfactory level of risk management and cultural change, we have actively initiated discussions about sexual assault with the leadership of other Greek organizations on this campus. Panhellenic Council recently held an event with UChicago’s Resources for Sexual Violence Prevention group, and members participated in a fraternity-organized roundtable discussion. Acknowledging that there remains much progress to be made, we were very pleased with the conversations and real motivation for change we saw in those rooms. Though our efforts to urge men’s Greek organizations to develop more robust systems of accountability were met with resistance, we are proud that sexual assault prevention has become recognized as a real and pressing problem. We look forward to further collaborating with other organizations next year to tackle this issue. Changes to the University’s relationship with Greek life have proved challenging for sororities. We are grateful that through the Student Engagement Fund, Kappa Alpha Theta, Alpha Omicron Pi, and Pi Beta Phi were able to reserve Mandel Hall and receive funding to plan philanthropy events. However, all of our organizations are limited by the 10 room reservations per quarter quota. While fraternities can hold large meetings in their houses, sororities (and most MGC organizations) are dependent on the University for space. We have 10 chapters and 10 leadership meetings alone per quarter, not to mention sisterhoods, study breaks, and philanthropy events. This presents significant financial challenges for us, though we hope it does not lessen socioeconomic diversity within our chapters. For the 2016–17 school year, recruitment will have to move off campus, as we will no longer have access to Ida Noyes Hall. There is a sad irony that the largest women’s organization on campus is losing access to UChicago’s historical women’s building. It is likely that Panhellenic dues and recruitment fees will increase to compensate for the cost of spaces off campus. The Student Engagement Fund process has forced us to plan for all of our space needs far in advance; it has been difficult to anticipate what space we will need before the executive councils for 2017 have even been slated. We are proud of all that our community has accomplished this year, and we hope Panhellenic will continue to be a vital and positive part of this campus for many years to come.